Thursday morning on my way to the Scandinavian Church in Sao Paulo to run cooking session. My lovely brasilian friend Luiza helps me to take all the staff, 5 big begs with food, pots, two cakes and Lady Pumpkin. This time we are going to prepare both Moqueca with Shrimps which we are going to serve in baked pumpkin. I learned this dish from my friend Luiza and she explained to me that once you serve Moqueca in the pumpkin it is called Bobó de Abóbora com Camarão. Thank you Beata and Cecilia for inviting me again to the Skandinavian Church. I hope we will celebrate Beata birthday as I took with me American Lime Pie. Hollow the pumpkin (you need to be careful not to damage the bottom of the pumpkin as it is going to serve as a pot for our Moqueca), remove the seeds and fibers, clean the inside of the pumpkin, rub it with salt - about 1 tablespoon of salt. Take some oil on the exterior side of the pumpkin. Place the pumpkin in preheated oven for about 40 minutes or until it feels soft inside. Cook cubes of pumpkin in a pot until they are soft. Take away the water and smash the pumpkin so it is ready to add to Moqueca. 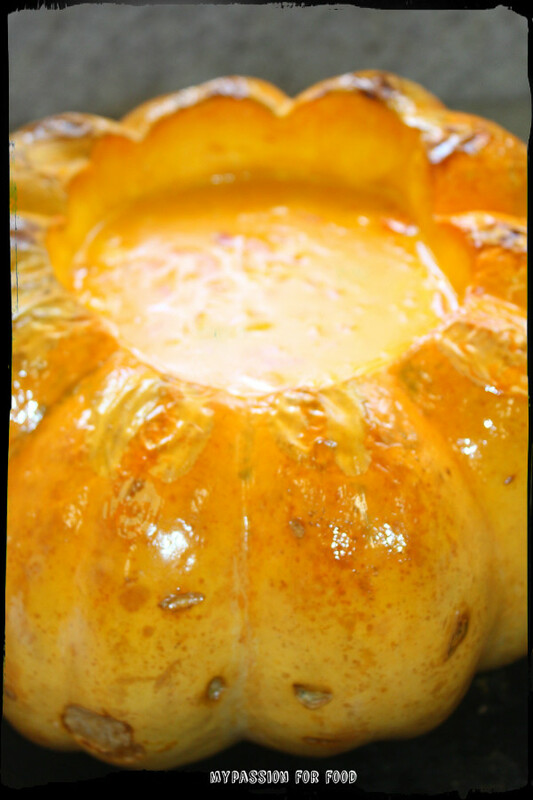 The smashed pumpkin we add to make the Moqueca thicker in consistence. Dice the onion, tomatoes and peppers. On the hot pan add palm oil (dendê), add vegetables and fry them about 5 - 10 minutes. Add coconut milk, stir constantly and bring to boil. 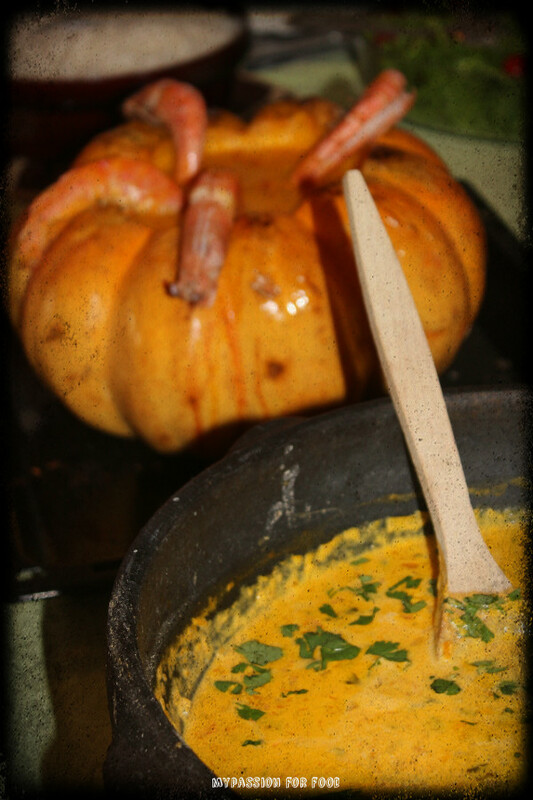 Remove the frying pan from the heat, add the pumpkin mousse, catupiry cheese, shrimps, some coriander. Put back on the heat and cook for 2 minutes. Season the dish with salt, freshly grounded pepper, sambal, lime juice and fresh cilantro. Sambal Oelek can be replaced with a fresh chili pepper. Pour the ready Moqueca with shrimps into the baked pumpkin and put in the oven for additional 10 - 15 minutes. Decorate with fried shrimps and serve with quinoa or rice and green salad. If you do not have time you can serve Moqueca in a pot. I just like the idea of serving it in the baked pumpkin! I promise your guests are going to be impressed. Enjoy!! !